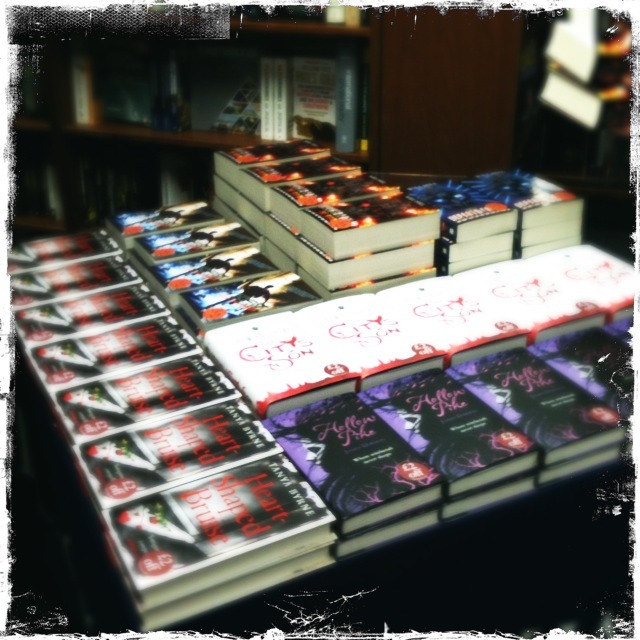 On Saturday past I got to moderate a panel of existing and debut YA writers at Blackwells in London. I’ve never done anything like it, but thankfully, as I knew everyone on the panel, having read their books and having met them socially and am friends with some of them (all of them) things went smoothly and it was lovely and relaxed. On the panel we had Will Hill (Department 19), Tanya Byrne (Heart Shaped Bruise), Tom Pollock (The City’s Son), Laure Eve (Fearsome Dreamer, out 2013), Kim Curran (Shift) and James Dawson (Hollow Pike). The turnout was fantastic, taking into consideration it was the hottest day of Summer (in fact, for four years apparently) and we got to have a captive audience of around fifty people listening to the panel – it was awesome. I asked the group how / what their path to publication was and apart from James and Tanya, who got their first books published, everyone spoke about the first book and how bad it was and how they got success with the second or third book. I like to think the conversation flowed well and as everyone knew everyone else, there was a lot of backwards and forwards. We broke up the questions with readings and oh, best idea ever though, was having each person introduce another person at the start of the event. It made for a lot of laughs and honest blushing. As I said, we asked a few questions, then 2 people did a reading, more questions, 2 readings etc. until Will closed off with event with a reading from Department 19. We sojourned to the Phoenix for refreshments and it was great hanging out with all these guys who are rising stars in the YA market here in the UK. I really think multi-author events are the way forward – as was evidenced by the wide spread of titles covered at the Blackwells event (and Foyles events in the past) it really goes to show that people may come for one author but sitting down, then listening to others talk about their book and their experiences…it makes you want to pick up their book and read it. I know this of old, sitting in on talks at Cons. You come away with more books than you brought along for signing. Also, books are far better for you than the double frappe with cream…also, they last longer. I had my lovely friend Jenni / @juniperjungle stay over for the weekend as she came down for the Blackwells event. It was great being able to spend time with her as she is wide-read and generally super cool to hang out with. She also inspires me to try harder and be a better writer. I like that. We went to dinner, quite late as it was so very hot, on Saturday evening. It was to a restaurant in Beckenham called Nene’s and we settled down and ordered our food and the next thing we knew, there was this utterly gorgeous woman in a skimpy outfit doing belly-dancing. Now, as someone who doesn’t really go out locally or even in town at night…I was agog. As was Jenni. I pretended to be all “oh yeah, this happens all the time” but it lasted about 2 minutes when I saw this girl wiggle her bum and hips. My god, if I tried doing that I think I would’ve broken my hipbone. We headed home after our delicious meal and watched Battleship with the hotness that is Taylor Kitsch. Being that good looking should be illegal. Mark came home late late from FightCamp looking tanned and tired. He watched the final scenes of Battleship with us, which was very gracious of him. All through this, I sat knowing that I had to work on Grimm. There are two major changes that I need to incorporate into the manuscript but I didn’t know how. Yesterday, after waving goodbye to Jenni I took myself upstairs and paced. And paced. I made lists of pros and cons, of how to do things. I paged through lore books and magazines and read the new SFX from cover to cover. I did a few chapters knowing what was coming but couldn’t bring myself to do it, because I’m a coward. So I watched movies instead. And then this morning, before work, I sat in Pret and got to the scene and pressed DELETE. And wham, gone was one of the major characters that everyone who read Grimm seemed to love. And into the vacuum created by his departure stepped an existing character who has been under-utilised throughout the story and BOOM! extra awesome is added unexpectedly. Imagine my surprise. If you can see me now, you’ll see the lightbulb above my head. I’m sparking, baby! This week is an exciting time for my friend Amanda Rutter who is officially launching Angry Robot’s fledgling imprint: STRANGE CHEMISTRY. I’m truly proud of her – she’s made a big change in her personal life in order to follow her dream. Not many of us can say this, so I wish her and her bunch of Strange Chem authors the best of luck for Thursday night. I’ll be there, not with a frock on, but I’ll be there wearing a party hat. Or a tiara. I’m not sure yet.